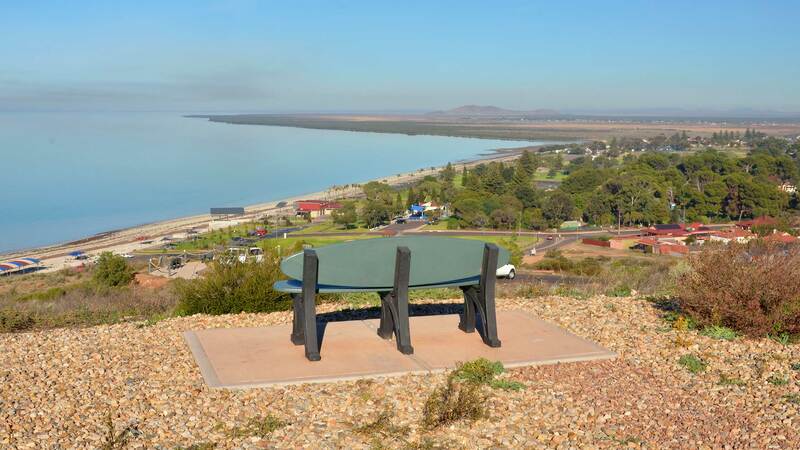 Overlooking the eastern end of Whyalla, Hummock Hill offers exceptional 360 degree views. Spectacular vistas can been seen from numerous lookouts. Turn your head and see the absolute contrast from overlooking the massive industrial expanse of the Whyalla Steelworks to the picturesque colours and textures of the Whyalla Foreshore from Hummock Hill; watch the ocean going ships get loaded from barges off shore; see if you can spot a resident dolphin in the marina. Survey the cityscape and coast and see what early explorers discovered and the city of Whyalla has developed. Capture your unforgettable Instagram moments and memories to share. Overlooking the eastern end of Whyalla, Hummock Hill offers exceptional 360 degree views. It was developed by BHP as a gift to the city to commemorate the company's centenary year, and opened during the 1986 SA Jubilee Royal Visit. Hummock Hill was the site of first settlement at the turn of the century. Development of the lookout utilised the old gun emplacements which can still be seen today. A one-way sealed road (suitable for both caravans and coaches) takes vehicles to the parking area adjacent to the lookout. Facilities include a restored wartime gun, heritage interpretive signage and a sheltered viewing and picnic area. During World War II Hummock Hill saw service as a gun battery with four guns and command and signals posts. Early stages of the fortifications were built by BHP workmen, but the majority of the work was carried out by gunners of the 26th Heavy Anti-Aircraft Battery under the supervision of the 65th Deputy Commander Royal Engineers who arrived in Whyalla on February 14, 1942. Hummock Hill affords an unequalled view of Whyalla and the vast OneSteel operations; Whyalla Foreshore and Marina; across Spencer Gulf to the Southern Flinders Ranges and including the nearby Santos plant at Port Bonython and the Point Lowly Lighthouse; and westward over the city towards the iron ore rich Middleback Ranges. The lookout offers magnificent views of the upper Spencer Gulf, Southern Flinders Ranges and Middleback Range in the West. In 1802 Matthew Flinders was the first European to navigate and chart this unknown coast of SA, solving the centuries old mystery as to whether Australia was one continent or two. Ten months later, in January 1803, Louis-Claude de Freycinet (1779 – 1842) navigated and charted the isolated coast for the Baudin expedition. He and his crew spent a night at False Bay, off what was to become Whyalla, and were impressed by the local scenery. 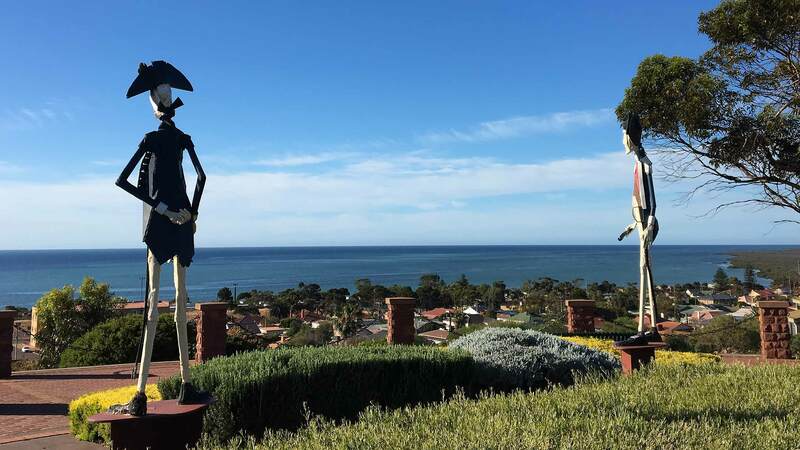 As part of the Encounter 2002 project to recognise French exploration, the two explorers were commemorated at the lookout by contemporary sculptures, whilst the area was renamed the ‘Flinders & Freycinet Lookout’. Access is from the northern side from Gerbhardt Avenue; a great spot to park your car and watch the sunset over the Middleback Ranges with Whyalla’s suburbs laid before you.